I had realized that I loved myself enough to let someone go. Béatrice Martin, better known by her stage name Cœur de pirate, catapulted to fame at age 18 with her self-titled debut album (2008), first in her native Montreal and quickly thereafter in France. With her Polaris-nominated follow-up, Blonde (2011), and in the four years leading up to her latest LP, Roses, the Québécoise chanteuse continued to rise in popularity on both sides of the Atlantic. 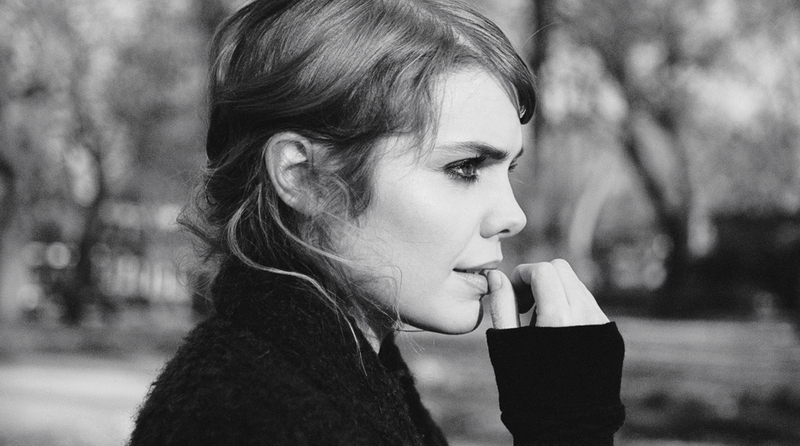 Coeur de pirate and Blonde were both up for Juno’s Album of the Year Award. Much has gone on in Martin’s personal life since that career-making, eponymous debut as well. Following her high profile breakup with rocker Jay Malinowski of Toronto’s Bedouin Soundclash, she married her Parisian tattoo artist husband and became a mother. The changes are very much the fuel to her fire on Roses, an exploration of Martin’s move from heartbreak and resentment to the joys and epiphanies that newfound love and motherhood afford, all while still in her mid-20s. All told, Roses is a decisively mature one for Cœur de pirate who’s well on her way to finding her own place on the pop spectrum in a wider commercial context. And make no mistake: Taking a cue from her previous francophone LPs, it’s Martin’s dazzling voice that leads the way on Roses, her first bilingual release. The shimmering anthem “Carry On”—”Oublie-moi,” the French rendition of the song, closes out the album—and the crestfallen “Crier tout bas” are true standouts. Martin is currently on the North American leg of her world tour in support of Roses, which will see her on the road well into 2016. You can purchase the album and find her itinerary after the jump. How’s life on the road at the moment? It’s going great, I love the West Coast! The Vancouver show was the first one of the stretch and it went great. Lots of traveling, but definitely worth it. I can’t wait to play L.A. or San Francisco again, to see how everything is evolving so far! How long have you been living in Paris now? You must be quite the hometown hero whenever you go back to Montreal. I do both, actually. Instead of having a cottage, we have a small apartment in France. Montreal is home to me, but Paris became kind of a second home as well. Roses marks your first bilingual album. In years past, you’ve often been asked questions like: ‘Will you always sing in French? Will you ever make an English-spoken album? Will you keep the name “Coeur de pirate” if you were to record an English album?’ How difficult was it to make those decisions leading up to Roses? I was a little stressed out at first because I had written these songs in English over the years and I didn’t know if they were any good. It all came from writing “Oceans Brawl” and wanting to record that one song. Then I felt it would be weird to only have one song in English on the record, so I wrote a couple more. It’s very representative of what I am and what I stand for, which is my heritage and that is in English and in French. In one of your recent interviews, you mentioned how you weren’t sure whether there was ever going to be a third album. Could you clarify? I didn’t know if I was going to put out a third record, so that’s Roses. Before Roses, I had been doing other types of work like composing and writing for other people, and I kind of liked that. I had a baby and I was into that as well. But as she grew up and I started touring again, I felt like I wanted to get back out there and share whatever I was doing with everyone. You must have so much material lying around. How did you curate this album? I have tons and tons of songs. [Laughs] I just kept the stronger ones, the ones that stayed in my head, and the ones that made more sense to me today. My writing and composing has changed so much throughout the years. It was hard to keep the ones that still felt current to me. Roses is still gloom-tinged, but it feels noticeably more introspective and enlightened than your previous efforts. Does that come with motherhood, family and, simply, growing up? I think motherhood and growing up helped me address the harder issues, knowing there is a light at the end of it all, that you can get out of tricky situations because there are people who depend on you. Before all that, I was pretty pessimistic. That being said, I address loneliness on this record. I felt very lonely at times, through all the magic. I address being an enabler and realizing that. I address my own imperfections and how it could be hard to love me in the long run. I dug deep down [Laughs]. I would’ve never done that before. I understand “Oceans Brawl” was one of the first songs you wrote that appears on the record. When was that one written? I wrote it after spending some time on the West Coast, actually, a long time ago, probably like back in 2011. I went with English because that song has a chant feel to it and it felt natural at the time. What I wanted to say was direct enough for English. It kind of had a folklore feel to it and I couldn’t quite get that in French because that’s not how I write in French. Did you write “Oublie-moi” in French or “Carry On” in English first? “Carry On” was written first, then I had to translate for France and Quebec as it was the first single. I think it’s safe to say that we’ve all had that one toxic relationship. It basically talks about the transition of my very bad life to a very stable life. I had realized that I loved myself enough to let someone go. Do you then play “Oublie-moi” for predominantly French-speaking audiences and “Carry On” when you’re in the States? Is it as straightforward as that? Do you change your sets around going from place to place? I haven’t changed anything! I just change up the language of my jokes, but that’s about it. Do you have a dance background? When did choreography enter the picture for your videos? A lot of artists recoil in horror when they’re asked to dance, let alone act. [Laughs] No, I don’t! I had never danced before “Carry On.” I had been training and I trained for those videos, but now it’s part of my everyday life. To me, dancing is a way of expressing my feelings other than music and there’s something very real to the physical translation of music through dance. I was fascinated by Pina Bausch and wanted to live that. I’m nowhere near that, but I wanted to feel something similar. Can you recall an early memory where you felt a deep connection to music? Oh yeah. I remember the first time I heard “…Baby One More Time” on the radio. I felt shivers. It was the perfect pop song with minor progressions. It was the first time I felt that way with a song. What’s the first record you ever purchased? Hypothetical question for you: If you chanced on an individual who has never before heard music in their lifetime—they don’t know what music is—what five songs would you put on a mixtape to get them started?